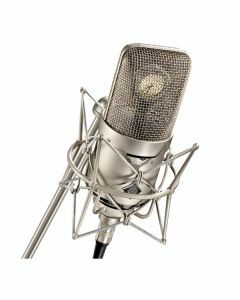 There are nine polar patterns to choose from, making this microphone an ideal choice for a wide range of recording situations. As its ancestors, the M 149 Tube is a superb vocalist microphone, not only because of the capsule, but also due to its modern circuitry, characterized by extremely low noise level. Neumann’s M 149 Tube is a vacuum tube condenser microphone that still enjoys a cardioid characteristic. The K 47 dual diaphragm capsule takes pride of place at the foundation of this the M 149’s mechanics, a component inherited from this model's now mythical predecessors, the U 47 and the M 49. Operating as an impedance converter, a tube comes after the capsule. Guaranteeing an exceptionally low self-noise level, the next stage is an efficient, transformerless output circuit. This pioneering combination of current tube technology with the most advanced solid-state circuitry was critical in awarding the 1997 TEC Award to the related M 149 Tube mic. Like all Neumann tube microphones, the M 149 Tube comes with a stylish satin nickel finish. The M 149 Tube can also link tremendously long microphone cables without affecting the quality of the audio signal. Additionally, it has a flat frequency response from 20 Hz to well above 20 kHz and selects a high-pass filter, advancing in half-octave steps between 20 Hz and 160 Hz (-3dB). The microphone is shipped as a complete set in a premium aluminium case. Included with the microphone are a cable, metal swivel mount for a mic stand and a compact universal power supply for standard mains sockets.